Those of you who attended Plus North will know that top plus size magazine SLiNK have launched SLiNK Boutique. A highly curated collection of plus size designer wear handpicked by SLiNK's very own fashion team. 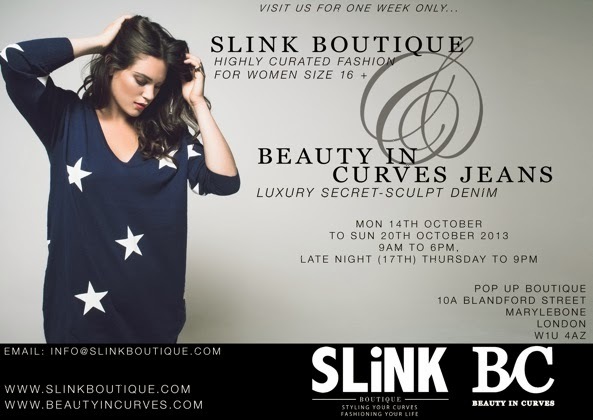 The online shop is already open and ready for you to peruse, but even more exciting, SLiNK in partnership with Beauty in Curves, luxury plus size denim brand will be hosting a week long pop-up boutique in London's stylish Marylebone. And even more excitingly I'll be there from the Wednesday until the Friday, playing shop girl and helping with any style dilemmas you might have! So if you're in and around London, come and see us and take full advantage of being able to get up close and personal with the clothes, feel the fabrics and try them on...and of course, buy!! !